To win the ST’s International Sign Contest Readers’ Choice Survey, signs need to be eye-catching. Similar to drivers passing by businesses on the road, readers look for signs that stand out in some way. 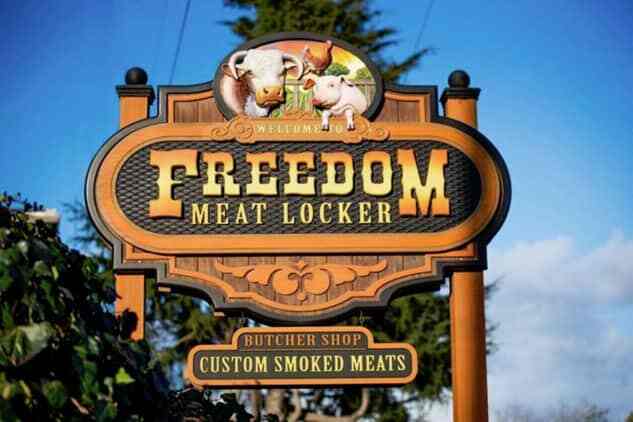 In 2016, Signs by Van captured the Reader’s Choice Champion Award for a 3-D sign developed for Freedom Meat Locker. The award validates the hard work put in by owners Phil and Jeremy VanderKraats, a father and son team, and staff. The custom sign company out of Salinas, Ca., competed against 20 other sign makers in the nationwide competition. Along with award, Signs by Van also took first place in its category. The award validates the company’s hard work, passion and creativity and shows that the community appreciates what it is able to produce. The award also has special meaning to Freedom Meat Locker, a client also committed to producing high quality products. Signs by Van stands out from other sign companies because of its use of different materials and processes to create vibrant signs. By using a range of software, devices and materials, including a CNC router, Adobe Photoshop and Illustrator, acrylic paints and fiberglass resin, the company’s experienced professionals are able to produce high-quality signs for different industries. For the company, design and craftsmanship have been important since the beginning. Owner Phil VanderKraats worked in casting, metal works and welding jobs before making his first since in 1981. Innovation has always been important for the VanderKraats family, and the team continually works to incorporate the latest technology into commercial and personal signs. For a sign recently produced for the Crab House, the company utilized LED lighting in the design. The result was a colorful, dynamic sign that makes a statement and fits with the restaurant’s message and brand. Located in the agricultural belt of California, Signs by Van has been providing signs to local businesses and individuals for over 30 years. The company works with a diversity of businesses, including restaurants, wineries and farms. The skilled sign professionals regularly develop personalized electrical, mural, metal, branding and wholesale signs for individuals and businesses. Signs by Van involves clients in every step of the design process and assists them with tasks such as getting city approval for signs. The company’s team of graphic designers and expert detailers are committed to designing signs that not only fit with a business’ brand but catch potential customers’ attention from up close and far away. When companies are interested in continuing to use their logos or brands, the company’s staff finds ways to keep their original artwork but update it to make it even more noticeable and interesting to the general public. Signs by Vans is currently in the beginning stages of its newest project, a mural on the south side of Salinas, located off Highway 101 and John Street. A work of art commissioned by Security Public Storage, the mural’s focus is expected to be Salinas’ agricultural history. The working title for the piece is “Bringing the Beauty Back.” Community members can take part in the project by providing ideas for a tagline and taking and share photos of the artwork.